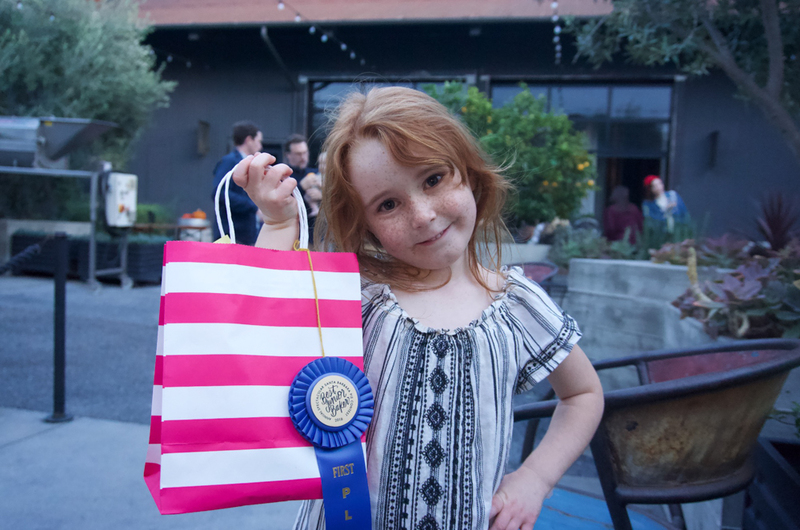 At the fourth annual Santa Barbara Pie Contest hosted by Leela Cyd and Joya Rose at Potek Winery in The Mill, preschooler Madelyn Dennis toasted the competition in the youth category with a true blue-ribbon sweet potato pie. The budding executive baker agreed to sit down over some tepid herbal tea and iced cookies to share her winning recipe and seasoned baking methods. I tried your delicious pie at the competition. Can you tell us a little bit about it? First, may I have a cookie? Sure. How many can I have? Hmm … These cookies are made with ginger. Wasn’t your pie also made with ginger? No, it had eggs in it. I liked cracking the eggs. Only eggs? Oh, yes, and ginger snap cookies in the crust. It’s really yummy. Everyone was encouraged to come up with an original name for their pie, and yours was “Rudolph.” Why? It was a reindeer. How did you do that? Googly eyes for the reindeer eyes and pretzels for the antlers. And jelly beans for the Rudolph nose. What was your favorite thing about the pie contest? Eating my pie. What did you win? A gift card from Game Seeker. What game did you choose? I got some face paint and a Hatchimal. Do you think you will be a lifelong baker? No. Well, maybe. I also like gymnastics. To make Dennis’s award-winning pie, prick sweet potatoes with a fork and roast in 400°F oven until tender, about 60-65 minutes. Grease a nine-inch pie pan with softened butter. Combine ¾ cup finely ground graham cracker crumbs, ⅓ cup sugar, 6 tbs unsalted butter, and ½ tsp ground cinnamon. Press mixture into a pie pan. Bake for 8-10 minutes. Mash cooled potatoes until smooth (you should have about 2¼ cups). Add ¾ cup milk, 3 large eggs, and 2 tsp fresh grated ginger, and whisk to combine. Add ½ cup light brown sugar, ½ cup granulated sugar, ½ tsp cinnamon, ¼ tsp allspice, and ¼ tsp kosher salt, and whisk until smooth. Pour into crust. Bake until filling is just set and surface starts to look dry and cooked, 55 to 60 minutes at 350°F. Cool to room temperature.